Raumfahrt+Astronomie-Blog von CENAP - Blog: Astronomie - The Higgs Boson May Have Saved Our Universe from Cosmic Collapse. For Now. Will the universe expand forever or eventually collapse into a tiny speck? A paper published in June suggested infinite expansion was impossible according to a major physics theory­ — a conjecture that made huge waves in the physics community. "People get very, kind of, emotional about it because if it's true and [is] discovered, it would be spectacular," said Timm Wrase, a physicist at the Vienna University of Technology. Now, Wrase and his colleagues have published a separate study that pokes a huge hole in that argument, which means an ever-expanding universe can't be ruled out just yet. Our universe is permeated with a vast, unseen force that seems to oppose gravity. 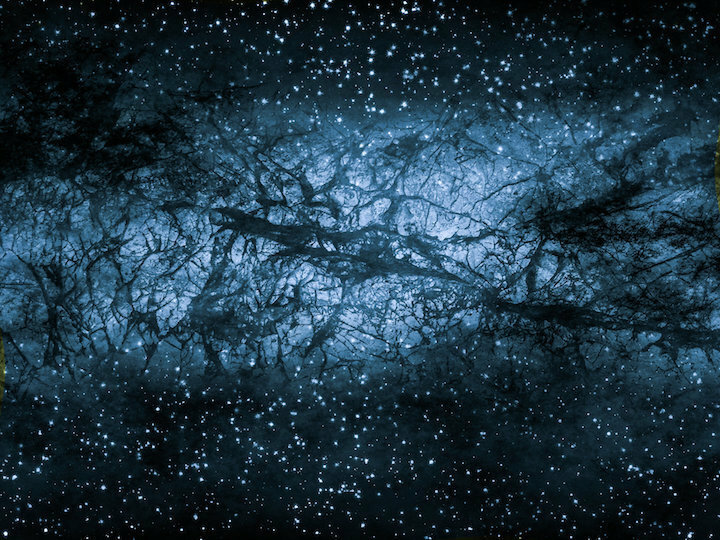 Physicists call this force dark energy, and it is thought to be constantly pushing our universe outward. But in June, a group of physicists published a paper in the preprint journal arXiv implying that dark energy changes over time. This means that the universe will not expand forever but might eventually collapse into the size it was before the Big Bang. Still, with a bit of theoretical tweaking, the collapsing-universe conjecture could still be viable, Wrase, a co-author on the new Physical Review D paper, told Live Science. How do we explain everything that ever existed? String theory, sometimes called the theory of everything, is a mathematically elegant but experimentally unproven framework for uniting Einstein's theory of general relativity with quantum mechanics. String theory suggests that all the particles that make up the universe are not really dots but one-dimensional strings that vibrate — and the differences in those vibrations allow us to see one particle as a photon and another as an electron. In order for string theory to be a viable explanation for the universe, however, it must incorporate dark energy. Imagine this dark energy as a ball in a landscape of mountains and valleys that represent the amount of potential energy it has, Wrase said. If a ball stands on top of the mountain, it may be still, but it can roll down with the slightest perturbation, thus it is unstable. If the ball is sitting in a valley, it's not changing or moving, has low energy and resides in a stable universe, because even a strong push would have it roll back down into the valley. String theorists long assumed that dark energy is constant and unchanging in the universe. In other words, it's snuggled up in the valleys between mountains, not rolling from the mountaintops and thus not changing through time, Wrase said. Rather, the landscape is a slight slope and the ball of dark energy is rolling ever downward. "While it is rolling downwards the dark energy becomes smaller and smaller," Wrase said. "The height of the ball corresponds to the amount of dark energy in our universe." In this theory, dark energy might eventually make its way below sea level and start to pull the universe back together to its pre-Big-Bang form. But there's just one problem, Wrase said. "We have showed that such unstable mountain tops have to exist," he said. That is because we know the Higgs particle exists. And we have experimentally proved that the Higgs particles can exist upon these mountaintops or "unstable universes," and can be disturbed with the slightest touch, he said. Cumrun Vafa, a string theorist at Harvard and senior author of the conjecture paper from June, told Live Science in an email that, indeed, the original conjecture has "difficulty with unstable universes." This new paper and a few others show this problem, he added. But there are several papers that proposed slight revisions to the conjecture that would still adhere to the limitations Wrase and his team proposed, he said. Even in the revised conjecture, "we would not be in a stable universe but rather things would change," Wrase said. The revision says mountaintops can exist, but stable valleys cannot, he said. (Imagine the shape of a horse's saddle). The ball has to eventually start rolling and dark energy has to change in time, he added. But "if the conjecture is [totally] wrong, then the dark energy could be constant, we would sit in a valley between two mountains," and the universe would keep expanding. Within 10 to 15 years, he hopes that satellites that more precisely measure the expansion of the universe can help us understand whether or not dark energy is constant or changing. Vafa agreed. "These are exciting times in cosmology and hopefully in the next few years we will see experimental evidence for the change of the dark energy in our universe," he said.